Sunday: Gradual clearing. Highs in the 50s and 60s. Sunday Night: Areas of fog, spot shower south. Lows in the 40s. Monday: Early clouds, then sun. Highs around 70. Morning fog and clouds are slowly eroding from north to south for Mother's Day, meaning skies will brighten over the course of the day. 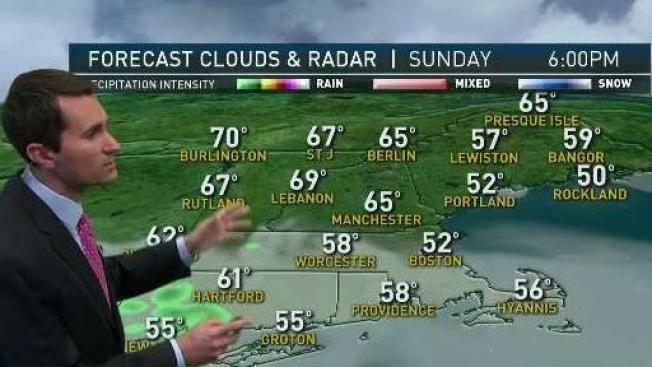 Sunshine will be brightest in Northern New England, with more clouds in Southern New England. A sea breeze will keep the coast in the 50's, with 60's inland. Fog redevelops overnight, with lows for many dropping into the 40's. A spot shower is possible near Long Island Sound or Cape Cod and the Islands, but most will stay dry. Fog burns off to sunshine on Monday, and winds turn to the southwest. That allows highs to surge well into the 60's and even into the 70's. By Tuesday highs are even higher, reaching the 70's to near 80. We’ll have more clouds on Tuesday though, with a few spotty showers or even a thunderstorm. Those showers will come courtesy of a front that will be wobbling near us. It will wobble back south on Wednesday, dropping temperatures down into the 60's for midweek. We'll still have a few showers. At this point Thursday looks like our best chance at being dry, before more showers return late week into the weekend. We'll have to watch the exact location of the front this week, because it will have big implications on both rain chances and our temperatures.